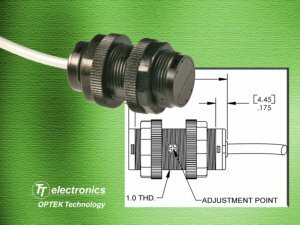 Carrollton, TX, USA - Providing design engineers with an adjustable reflective switch to meet a number of non-contact reflective object sensing application needs, TT electronics OPTEK Technology has enhanced its long distance reflective switch with adjustable sensitivity and simplified mounting. The OPB725A-18Z device uses an infrared LED and a logic output sensor in a reflective switch configuration, and features a reflective sensing distance of up to 24” depending on the object. The OPB725A-18Z switch is tested to ensure detection of an 8” x 8” 90 % diffuse reflective white card at a distance of 18”, with the sensitivity set to maximum (clockwise rotation) by the trimpot, which is accessible through a 4.3 mm diameter hole in the sensor body. Additional applications for the OPB725A-18Z long distance reflective switch include assembly line and machine automation, equipment security, machine safety, as well as door and end-of-travel sensing. The OPB725A-18Z long distance reflective switch features an 850 nm LED, and is offered with 48” (122 cm) 26 AWG wires with mounting nuts. Power dissipation is 250 mW, maximum collector voltage is 30V, and collector DC current is 50mA. Operating temperature ranges from 0°C to +50°C. While an object is in the reflective path of the switch, light from the LED is reflected back to the housing, irradiating the surface of the logic output sensor. This causes the output NPN transistor to turn “on,” providing a “low” (0.8 V max) output voltage when connected to the appropriate value pull-up resistor. When the infrared light from the LED is not reflected to the Photologic sensor, the output transistor turns “off,” minimizing the IC(ON) current and providing a “high” (22 V min) output.